One of the first posts that I wrote on this blog was called Attachment parenting has not caught on in France. We were in France at the time, visiting my in-laws, one of many trips that we made there both before and after having children. It seems while I was busy observing, commenting on (and perhaps judging) French parenting choices, French feminist Elisabeth Badinter was observing, commenting on and judging our chosen parenting style. Funny how that works. In her book, The Conflict: How Modern Motherhood Undermines the Status of Women, Badinter sets up a conflict between mothering and feminism; one that I don't think exists as I pointed out in my post last week called Badinter's "The Conflict": Oppression of Mothers Through the Lens of France's Hegemonic Masculinity. So when the New York Times contacted me and asked me if I wanted to comment on the issue, I agreed immediately. Is Badinter right? Has women’s obsession with being the perfect mother destroyed feminism? In particular, has this trend of “attachment parenting” been bad for working moms? The New York Times collected responses from a number of different voices (albeit with many perspectives underrepresented or missing), including Mayim Bialik, Erica Jong, and Pamela Druckerman in a piece entitled Motherhood vs. Feminism, which they published in their Room for Debate. 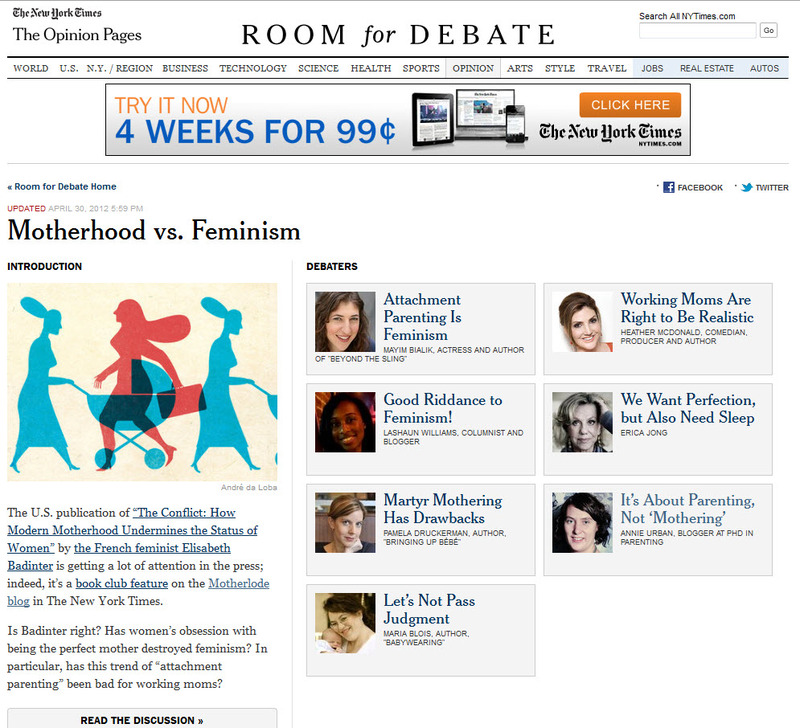 "Motherhood vs. Feminism" is an NYT debate. Next up: "Fatherhood vs. Sports," "Childhood vs. School," "Coats vs. Shoes" and "Cats vs. Dogs." Of course they are all right. I didn't like the way that Badinter's book positions feminism and "intensive" mothering in opposition to each other. I don't think we need an "or" or a "vs" in this conversation. I don't think it helps women. I don't think it helps children. And, depending on your perspective, it either lets men off the hook or it unfairly assumes they are incapable or uninterested in contributing anything more than sperm and possibly a paycheque. But despite all of that, I felt compelled to contribute my voice to the discussion (a discussion I knew would happen with or without my perspective). While I didn't like Badinter's message and I didn't like the New York Times question, I do understand that their question stemmed from her ridiculous hypothesis and wasn't just something an editor dreamed up to fuel the 'mommy wars'. Despite not liking it, I did feel it was important to point out the fact that fathers are a significant missing link in this discussion. If we do not talk more openly and frequently about the role that fathers can, should, and often want to play in parenting, then we will not see the societal shifts that are needed to migrate away from the conflict that women feel between their careers and their families. My piece on the New York Times, which they entitled "It's About Parenting, Not 'Mothering'", talks about the need to push for a society that values fathers who strike a balance between their career and their family life too. Sure, attachment parenting (or any type of parenting) can feel oppressive if you are doing it all alone. But if women have a partner and a community around them that supports them, then it shouldn't be unrealistic to have both parenting goals and career goals. There are so many options beyond the traditional model of one parent working and the other parenting staying home vs. both parents working and the child being in a traditional day care. And then of course there are many other single parent (mostly single mother) families, where those options don't even come into play. We need to be more creative. We need to look at models that work and share those ideas. We need to understand that each model may work for some family out there, even if it doesn't work for our own for some reason. Most of all, we need to be recognize that this is not a battle between feminism and motherhood, nor is it a battle between feminists and mothers. As a feminist mother, I don't want to be forced into a false dichotomy, I want to push for societal changes that will forever erase the pretend division. bravo - great contribution to the debate. i enjoyed reading your post and your NYT article. eloquently articulated. Third Path Institute. Shared care is one of the main things this organization focuses upon: how to create the balance between family life & work life in a way that makes you thrive (my words). I loved the cats v dogs analogy. I really liked your response, Annie. Women are excelling in the workplace and in universities across the board with motherhood positioned as (perhaps) the last big feminist hurdle. If we work toward normalizing fathers as an equal, if not primary, caregiver in the family, then things like child care and education can finally stop being "women's issues." I couldn't agree more. I think that as women continue to graduate from university at higher rates than men, while at the same time we shift to a more knowledge-based economy, fathers will have to play a larger role. It's inevitable, in my opinion, and I can already see it happening in my own circle. You nailed it -- she is out of touch with this generation completely. I also pointed out in the earlier conversation here at Annie's site that I have a major problem with an older feminist telling younger women how to "do" our feminism. It's like the second wave being told they HAD to be maternal, first wave feminists. Thanks for giving us a little peek behind the scenes, Annie. Your perspective is the only one of the NYT debate pieces that really hit home for me - and as a very successful career woman with a husband who stays home with our three children and practices attachment parenting alongside me, I can vouch for the fact that it is his support that helps make me so successful at both home and work. It is time for the world to get on board with the concept of shared parenting, and I'm glad you continue to push that idea! Thank you Annie. I hate the word motherhood specifically because it leaves out half of the equation. But I think the fundamental flaw in this debate is even deeper - why do we only talk about it from the top down, i.e. from the parenting perspective? Why don't we talk about child-rearing and put the emphasis and the societal value on the kids. I think if we did that, if we could mold our society to value children and the caring of children, then we'll all be equally encouraged/allowed to participate. And the fight over who does what will fall away on its own. And on a slightly different note, did anyone else think Erica Jong's complaint that Americans aren't as affluent as the Chinese rather absurd?? Bang on. I understand why women of their generation have the perspective they do. They had to fight just for the right to have a job in the first place. They've won that battle for us (although workplace equity still has a long way to go) so now we get to exercise our choice, but they're perspective on which choice is better is rooted in the memory of their own struggle, rather than taking our needs into account. Actually, I did mention the divide between second wave feminists and third wave feminists in http://www.phdinparenting.com/2012/05/03/motherhood-and-feminism-the-ny-times-discussion-and-its-aftermath/" rel="nofollow">my piece for the New York Times and I mentioned and linked to Katie Allison Granju's articles regarding Badinter's links to Nestle, Similac and Enfamil http://www.phdinparenting.com/2012/04/29/badinters-the-conflict-oppression-of-mothers-through-the-lens-of-frances-hegemonic-masculinity/" rel="nofollow">in my last post (as well as on my facebook page). But I do agree that most discussions about her book are ignoring those issues. Was unaware of Badinter's connection to Nestle - interesting! and definitely spins her thoughts in a whole new light. Also... "ayatollah's of breastfeeding?" Yikes! Annie - thanks for linking to my post. *this* is the kind of dialogue/discussion that is productive and useful, rather than slamming parenting ideals/techniques. Perhaps what feminists of Badinter's generation are forgetting is that we are not making these choices in the same context that they lived in. What they need to remember is that they fought for us to be able to make choices. Period. To say that we need to make certain choices in order to be a real feminist is - in my mind - no less oppressive than saying we have to make certain choices in order to be a "good" wife or mother. Your piece was the best of the bunch, Annie. Motherhood AND feminism AND fatherhood, working together to create a world in which caregiving is recognized as a crucial societal value. When we have just as many stay-at-home dads as women CEOs, our revolution will be complete! i would also like the debate (elsewhere) turn around into constructive and not divisive. i don't think the question is whose brand of feminism is better, and who wins, and so on. this is exactly the trap which those who wish the gender stereotypical status quo to continue rub their hands in glee at - we're falling right into that one with saying that feminist A is bad/irrelevant, feminist B is good/relevant. i'm grateful for the historical insight into the feminist timeline; it's helping me understand my own past and i hope showing others how the movement has evolved cf. deteriorated. we do need to appreciate however, that time does not stand still (what a galloping cliche!) and that move to equality in parenting/child raising embraces all genders. This was awesome! This should have been the features article not the ridiculously titled feminism vs motherhood in the NYT. I am still learning bout the balance of life a a parent and don't see the challenge as ever ending but I certainly don't see it as a war against others choices or lifestyles. Thank you for bringing in fathers & community. How the heck is there ever a parenting "debate" when (half ?) of the equation isn't even mentioned. In reality, I feel like my family, friend, kids father, & my community aren't just a part of my children's life & my parenting, we are all very intricately entangled. Thanks again, loved you level headed view. I just wanted to echo what others have say...it always feels like such an empty discussion when "mothering" is discussed in these contexts without bringing "parenting" "fathering" and community into the debate. One of my favorite things that happened while I was in college was that Anna Quindlen (alumna of my college) responded to the tired old question "How do you balance work and family?" with a sigh and a question of her own. She said, "When are we going to hear young men asking 'Gee, how will I balance work and family when it comes time for me to have kids?' Because I know too many young men who think that they will achieve balance by getting married." Thank you for bringing this point into the light. We can't repeat it enough. You make a much needed point about the presence and importance of fathers! I complain sometimes that I have to work and how I wish I could be home with the kids full-time but that would require my husband working almost 80 hours a week (in order to afford a 2 bedroom apartment, pay back student loans, pay car loan and keep oldest in her preschool, so we don't live luxuriously for those wondering) That wouldn't be fair. We have been there, done that and it was awful for him and for the kids who could go days without seeing daddy. I feel proud and almost arrogant to a point that my kids have a father who actually knows those little day to day minute details that many working husbands to full-time stay at home moms will never know. I'll be seriously interested in seeing what research has to show about kids who grew up with full or part-time at home dads!! Your NYT post was great, Annie! Thanks for your comment - I too appreciated it's unique and far more balanced tone. I think another issue in this whole discussion that might impact how Canadian mothers interpret it surrounds maternity leave. With our 50 weeks of leave (plus or minus according to personal preference), most of my mama friends are able to practice attachment parenting if they want to, without making quite the same sacrifices American (or French) mothers might have to. I'm able to exclusively breastfeed for a year at least, choose to use cloth diapers for environmental reasons, etc etc because I have paid maternity leave. Of course, I also have friends who make those choices - both in Canada and the US - without the generous benefits I have. Above all, I personally find that so many aspects of my parenting style (which Badinter would likely consider heavily influenced by attachment parenting, although I'm not inclined to be quite so labelled) work for me because I'm lazy and find they provide the path of least resistence. My partner is happy to support things like BFing and CDing, which fall primarily to me, while taking on other significant parenting and household responsibilities and working full-time. In no way do I feel repressed or oppressed in what might appear to be my very traditional role. Feminism for me is all about being able to have options and rights. I can go to the university of I so choose to, because women have now the right to study in a university. I can do a PhD if I so choose, I can become a CEO, or a politician or a police officer. In the same time I can also choose to be a stay at home mother and exercise my biological qualities/skills. I can BF at home or in public, I can practice attachment parenting and snuggle my kids all day long or educate them at home if I so choose. I don't see where motherhood is going against feminism. The feminist movement only added a set of extra rights for women but never deleted the already existing one, that of being a mother. Sure if you choose to be an extremely dedicated mother you might not be able to keep up with a highly demanding career, but at the end of the day we do now have the choice, which is what feminism is about. Hi Annie and all the readers! I have a question and decided to post it here though this is a late post. Could you recommend any books that expands on feminist mothers (especially on the second wave of feminism where motherhood/breastfeeding is considered a women's right)? Thank you!